There is precious little left in the fridge. That is if you don't take into account several dozen beers from all over the world. Well, mostly Canada and Belgium. As we wind down our inventory the pickings are getting slimmer and slimmer. Luckily there still are some things in the fridge so cobbling something together tonight was possible. Tomorrow, I'm afraid, we may have to eat shrimp with peanut butter and barbecue sauce. 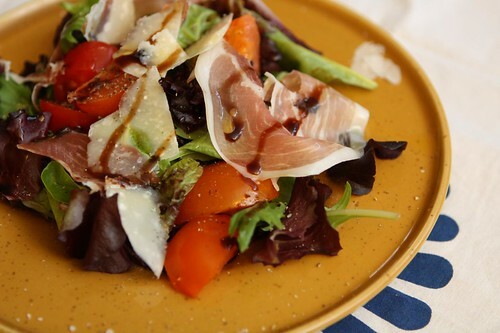 For a salad I topped some spring greens with La Quercia Speck, shaved Parmigiano-Reggiano, sliced tomato, olive oil, salt, pepper, and balsamic glaze. 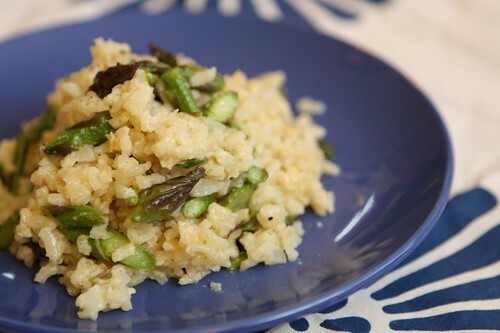 We still had some New Jersey asparagus in the fridge from the weekend so I made this risotto with onion, garlic, white wine, arborio rice, and rendered slab bacon. I finished it with a splash of heavy cream, butter, and the remainder of a chunk of Robusto from the fridge. As an accompaniment I had the fifth of six Belgian beers generously given to my by my parents. 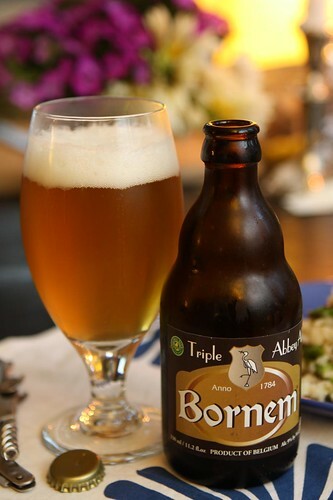 Tonight's beer: the Bornem Triple from Brouwerij Van Steenberge. This was lighter than I'd thought it would be and tastier. Since we have no cable we are spending the rest of the evening refreshing Google to see if my Boston Bruins will make it to the Stanley Cup Finals for the first time in twenty-one years or if they will be a huge disappointment for the first time in one year. Here we go, Bruins, here we go!